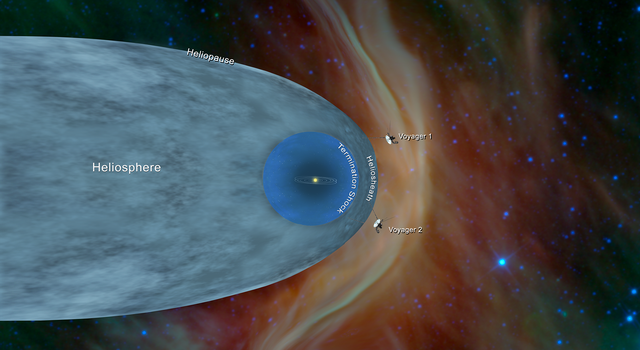 …Then There Were Two: Voyager 2 Reaches Interstellar Space… – A Nibble – A Bite – or a Meal! The Voyager 2 spacecraft, launched in 1977, hasreached interstellar space, a region beyond the heliosphere – the protective bubble of particles and magnetic fields created by the Sun – where the only other human-made object is its twin, Voyager 1. The achievement means new opportunities for scientists to study this mysterious region. And for educators, it’s a chance to get students exploring the scale and anatomy of our solar system, plus the engineering and math required for such an epic journey. Launched just 16 days apart, Voyager 1 and Voyager 2 were designed to take advantage of a rare alignment of the outer planets that only occurs once every 176 years. Their trajectorytook them by the outer planets, where they captured never-before-seen images. They were also able to steal a little momentum from Jupiter and Saturn that helped send them on a path toward interstellar space. This “gravity assist” gave the spacecraft a velocity boost without expending any fuel. Though both spacecraft were destined for interstellar space, they followed slightly different trajectories. 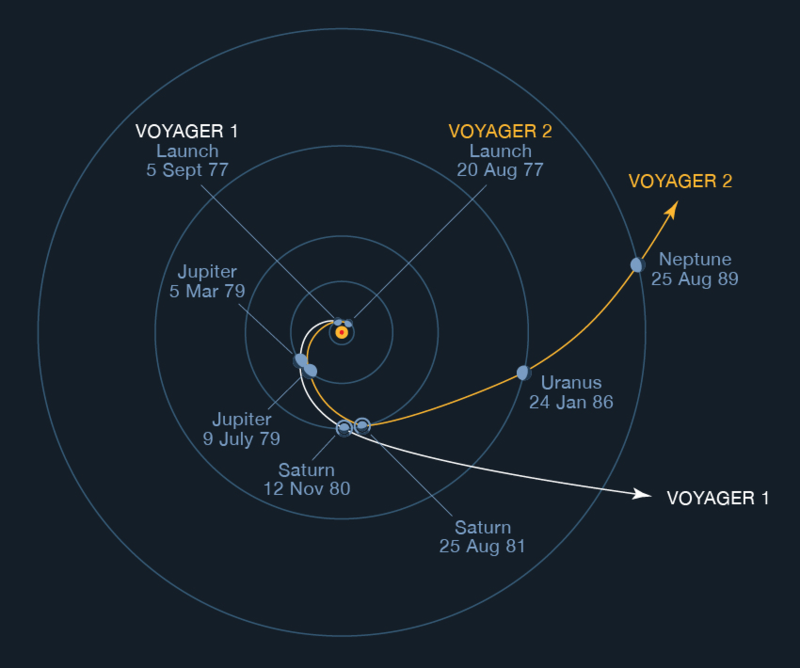 An illustration of the trajectories of Voyager 1 and Voyager 2. Voyager 1 followed a path that enabled it to fly by Jupiter in 1979, discovering the gas giant’s rings. It continued on for a 1980 close encounter with Saturn’s moon Titan before a gravity assist from Saturn hurled it above the plane of the solar system and out toward interstellar space. After Voyager 2 visited Jupiter in 1979 and Saturn in 1981, it continued on to encounter Uranus in 1986, where it obtained another assist. Its last planetary visit before heading out of the solar system was Neptune in 1989, where the gas giant’s gravity sent the probe in a southward direction toward interstellar space. Since the end of its prime mission at Neptune, Voyager 2 has been using its onboard instruments to continue sensing the environment around it, communicating data back to scientists on Earth. It was this data that scientists used to determine Voyager 2 had entered interstellar space. Interstellar space, the region between the stars, is beyond the influence of the solar wind, charged particles emanating from the Sun, and before the influence of the stellar wind of another star. One hint that Voyager 2 was nearing interstellar space came in late August when the Cosmic Ray Subsystem, an instrument that measures cosmic rays coming from the Sun and galactic cosmic rays coming from outside our solar system, measured an increase in galactic cosmic rayshitting the spacecraft. Then on November 5, the instrument detected a sharp decrease in high energy particles from the Sun. That downward trend continued over the following weeks. The data from the cosmic ray instrument provided strong evidence that Voyager 2 had entered interstellar space because its twin had returned similar data when it crossed the boundary of the heliosheath. But the most compelling evidence came from its Plasma Science Experiment – an instrument that had stopped working on Voyager 1 in 1980. Until recently, the space surrounding Voyager 2 was filled mostly with plasma flowing out from our Sun. This outflow, called the solar wind, creates a bubble, the heliosphere, that envelopes all the planets in our solar system. Voyager 2’s Plasma Science Experiment can detect the speed, density, temperature, pressure and flux of that solar wind. On the same day that the spacecraft’s cosmic ray instrument detected a steep decline in the number of solar energetic particles, the plasma science instrument observed a decline in the speed of the solar wind. Since that date, the plasma instrument has observed no solar wind flow in the environment around Voyager 2, which makes mission scientists confident the probe has entered interstellar space. This animated graph shows data returned from Voyager 2’s cosmic ray and plasma science instruments, which provided the evidence that the spacecraft had entered interstellar space. Though the spacecraft have left the heliosphere, Voyager 1 and Voyager 2 have not yet left the solar system, and won’t be leaving anytime soon. The boundary of the solar system is considered to be beyond the outer edge of the Oort Cloud, a collection of small objects that are still under the influence of the Sun’s gravity. It will take about 300 years for Voyager 2 to reach the inner edge of the Oort Cloud and possibly 30,000 years to fly beyond it. By that time, both Voyager spacecraft will be completely out of the hydrazine fuel used to point them toward Earth (to send and receive data) and their power sources will have decayed beyond their usable lifetime. Since the Voyager spacecraft launched more than 40 years ago, no other NASA missions have encountered as many planets (some of which had never been visited) and continued making science observations from such great distances. Other spacecraft, such as New Horizons and Pioneer 10 and 11, will eventually make it to interstellar space, but we will have no data from them to confirm their arrival or explore the region because their instruments already have or will have shut off by then. Interstellar space is a region that’s still mysterious because until 2012, when Voyager 1 arrived there, no spacecraft had visited it. Now, data from Voyager 2 will help add to scientists’ growing understanding of the region. Scientists are hoping to continue using Voyager 2’s plasma science instrument to study the properties of the ionized gases, or plasma, that exist in the interstellar medium by making direct measurements of the plasma density and temperature. This new data may shed more light on the evolution of our solar neighborhood and will most certainly provide a window into the exciting unexplored region of interstellar space, improving our understanding of space and our place in it. As power wanes on Voyager 2, scientists will have to make tough choices about which instruments to keep turned on. Further complicating the situation is the freezing cold temperature at which the spacecraft is currently operating – perilously close to the freezing point of its hydrazine fuel. But for as long as both Voyager spacecraft are able to maintain power and communication, we will continue to learn about the uncharted territory of interstellar space. Ota Lutz is a STEM elementary and secondary education specialist at NASA’s Jet Propulsion Laboratory.